So... I read another YA dystopian novel with a strong female lead. I can't help myself. I'm sorry. First off, this book was nothing like I expected. It follows Madi, a determined young woman who's parents have disappeared. When she learns that they were sent on a secret mission to Earth, she decides to go there and rescue them. Instead of a barren wasteland of long abandoned technology, the Earth is still populated with people who have hyper-evolved in the past few centuries. There are tree people and lizard people and fish people. Madi discovers that even she has evolved--and has telekinetic powers. To be honest, I don't think she needed any special abilities and it didn't add much to the story. Through most of the book, Madi really isn't too focused on finding her parents and instead explores the diverse landscapes of Earth. Every setting is vividly detailed, beautifully described, and breath-taking. The settings paired with the developing relationship between Madi and Torian kept me reading--although the inter-species relationship did kind of creep me out. There wasn't much resolution at the end of the book, making me think that there will be another installment. And if there is, I will definitely pick it up. Madi's story isn't done, and I'm looking forward to reading what happens next. 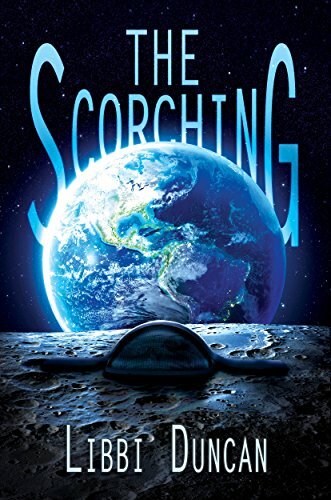 If you like beautiful settings and strong women, then you'll love The Scorching.